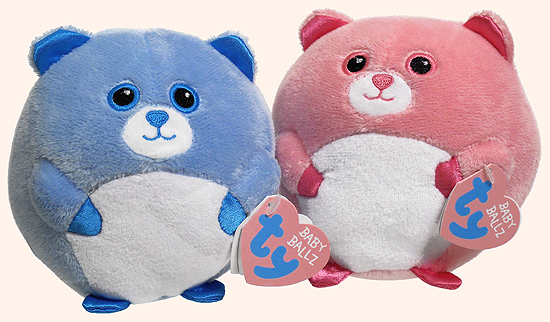 Ty Baby Ballz were introduced in the Spring 2013 Ty Retailer Catalog. Their appearance on the catalog's Pluffies page caused some speculation as to whether they would have Beanie Ballz or Pluffies swing tags. Never at a loss for surprises, Ty shipped the new Baby Ballz with their own special swing tags. For reference purposes, we are categorizing the Ty Baby Ballz as a new separate Ty product line. The first two Ty Baby Ballz named Bluey and Pinky have built-in rattles that sound like a cross between a cow bell and a wind chime. The tush tag states the Baby Ballz are machine washable. They have embroidered eyes and the fabric is soft, similar to the fabric on the Ty Pluffies products.